Hi guys at present time billion of person use different companies iPhone, Android smartphone. Most of the person facing the problem about cluttered up inbox with the text messages. Will you also face this problem on your smartphone? If yes then you want to know how to overcome that type of situation. What is the way to auto remove old messages from Android, iPhone. Most of the person daily send or receive lot of messages. When your inbox full with these messages, they delete unused messages one by one. Lot of persons accidentally remove his important messages. So, most of the person transfer his important messages from phone memory to SD card. Today, you must have to know how to auto remove old messages from Android, iPhone. For this you can set given message settings to auto remove old messages from Android, iPhone. If you want to auto remove old messages from Android smartphone then you will face little bit problem. Because there are lot of versions available for Android smartphone. These Android smartphone updated in a regular time inter-well. Google Hangout is the default messaging app of all Android smartphone. Now, you can take following simple steps to auto remove old messages from Android smartphone. Step 1: Open the Google Hangout in your Android smartphone to auto remove old messages from Android. Step 2: Tap on the three horizontal lines which is placed on the top left corner of your Android smartphone. Step 3: Tap on the Settings > Tap on the SMS > Tap on the SMS Disabled and click on the OK button > Click OK. Step 4: Tap on the Advanced option > Turn on Delete old messages. 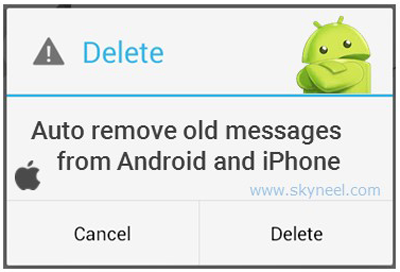 After turn on this option your Android smartphone automatically delete old messages as limits are reached. Step 1: Tap on the Settings option on your iPhone. Step 2: Tap on the Messages option. Now, scroll down and tap on the Message History. Step 3: Tap on the Keep Messages option. Here you will get three options 30 Days, 1 Year and Forever. By default Forever is selected. Step 4: Choose 30 Days option. After choosing this option your iPhone automatically delete messages which is older than 30 days. You can also choose 1 Year option. If you choose this option iPhone automatically delete messages which is older than 1 year. I hope you like this article.After reading all these easy steps you will be able to easily delete or auto remove old messages from Android, iPhone.Kindly share your knowledge with your friends, family members and others. Thanks to all.